A suspected tsunami in the Bristol Channel which killed 2,000 people happened 400 years ago on Tuesday. 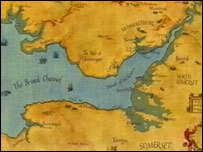 Experts believe severe flooding on 30 January 1607 in south west England and south Wales was caused by a tsunami - and not a storm surge or high tides. It is estimated 200 square miles (520 sq km) of land were covered by water. Professor Simon Haslett from Bath Spa University said there was currently no tsunami warning system in place. He said the research was important for informing coastal and risk management plans. The flood of 1607 has been described by experts as the worst natural disaster to hit Britain. Eyewitness accounts of the disaster told of "huge and mighty hills of water" advancing at a speed "faster than a greyhound can run". Professor Haslett carried out extensive research into the cause of the flood alongside Australian geologist and tsunami expert Ted Bryant from the University of Wollongong in 2003. "When I was young, I remember seeing in some books in the library some woodcuts of pictures of people stranded on the top of high roofs, trees and clinging onto the back of sheep - very dramatic scenes," said Professor Haslett. "You can't really imagine what it must have been like other than the human tragedy of it. Quite catastrophic and how they dealt with it is quite amazing," he said. 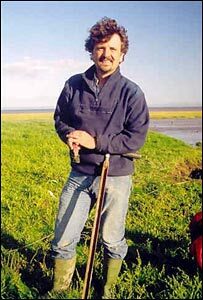 In a Timewatch programme shown on BBC 2, Professor Haslett and Dr Bryant revealed evidence around the Severn Estuary which appeared to back their theory. This included a layer of sand in mud deposits in five different places: Hill in South Gloucestershire, Rumney Wharf in Cardiff, Llangennith Moor in Swansea, Croyde Bay in north Devon and Northam Burrows near Bideford, Devon. Pebbles and pieces of broken shell were found in these areas. They claimed these deposits were brought in from the open ocean. "There's no beach for miles so that's an indication that this stuff has been transported a considerable distance," said Dr Bryant. "The way some of the flow behaves, it will not break the material, so to find material as fragile as this in this type of deposit shows that it was a tsunami." It swept up to four miles inland in north Devon, Pembrokeshire, Glamorgan, Monmouthshire, Cardiff and Somerset. Another piece of evidence they believe backs up their theory is an eyewitness account which describes seeing "sparks" coming off the top of the wave - a phenomena unique to tsunamis. "Whether it is sand on the marsh, or it's pebbles in the clay, or it's erosion on the headland or boulders piled up in key spots, you go for the simplest explanation, and I can put down most of the signs we have seen down to one wave," said Dr Bryant. Dr Roger Musson, head of seismic hazards at the British Geological Survey, said there are examples of earthquakes in the area caused by an ancient fault off south-west Ireland. "We know from seismological evidence, that we have actually had an earthquake here - so there is a fault and it is moving. It is active." Dr Musson believes the event was caused by a storm surge but "the idea of putting a large historical earthquake in this spot is not so fanciful." Dr Kevin Horsburgh, from the Proudman Oceanographic Laboratory in Liverpool, said the disaster was caused by a massive storm surge, formed by a combination of high tides and hurricane winds. "A storm surge is going to provide some billions of tonnes of water rushing across the flood plain and is more than capable of picking up enormous rocks and large amounts of sediment and depositing them a long way away," he said. Other UK tsunamis include a 70ft (20m) high wave that hit Scotland 7,000 years ago, following a massive landslip in Norway.